We had a great time at the cabin in the woods. Our boys didn’t want to leave. Debbie was super helpful is making sure we had everything we needed. We’d love to come back again sometime! We have been using VRBO cabins/condos/houses for over 20 years and have never stayed anywhere that was so well equipped. Everything from spices, paper towels to extra pillows/blankets were provided ,on top of being very clean and well kept. We would definitely rent again if in the area. Thanks for allowing us to share your cabin Debbie and Bob! Absolutely loved our stay at Cabin in the Woods. The cabin itself is super nice. It was only my hubby and I celebrating our anniversary, so we had so much space to ourselves! Would definitely rent again for a family/friends vacay. My family and I loved our stay at Cabin in the Woods! We enjoyed every bit of our time at Cabin in the Woods. Even though it rained the entire time, my teenaged boys still went out to explore. The hot tub was a great commodity. It was perfect! The cabin is stocked with pots, pans and other household items you could possibly need in the bathrooms, kitchen and bedrooms! I was so very impressed with the cleanliness of the cabin. It was spotless! 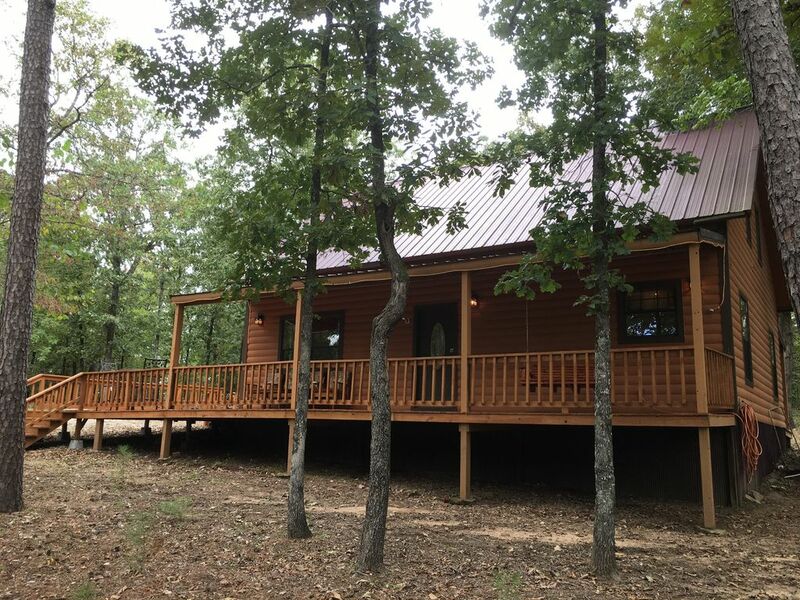 This is a beautiful cabin that fit our family of 7 just perfectly; 2 adults, 4 teenagers and a toddler. In addition to all I've mentioned, there were even family games to play. We definitely took advantage of that. An amazing and relaxing time was had by us all. Thank you so much for sharing your beautiful property with us! The cabin was just what we needed for our getaway. The amenities, including the hot tub, make it so you never have to leave. But when you do there is plenty of stores, restaurants, and attractions within 30 minutes. Thank you for sharing your home with us. Perfect! Has everything you need! Great experience. So quiet and peaceful. Close enough to Broken Bow and activities, but far enough away to enjoy the quiet of nature.